Co-Dependents Anonymous of San Diego is a fellowship of men and women whose common purpose is to develop healthy relationships. The only requirement for membership is a desire for healthy and loving relationships. We rely on the Twelve Steps and Twelve Traditions for knowledge and wisdom. These are the principles of our program and guides to developing honest and fulfilling relationships. Through applying the Twelve Steps and principles in CoDA to our daily life and relationships, both present and past, we can experience a new freedom from our self-defeating lifestyles and realize a new joy, acceptance and serenity in our lives. 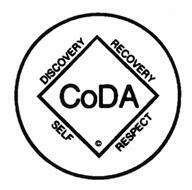 If you are a newcomer or a mental health professional seeking additional information about CoDA and codependency, please visit the outreach section of our site. The 2019 Annual One-Day Conference and Regional Assembly is June 8th, at the Marina Village Conference Center in San Diego. The theme is "Stepping into Wholeness" - Register on-line here and download the color flyer HERE. This will be a day filled with Inspiring Workshops (English & Spanish) Keynote Speaker, Assembly Lunch, Fellowship & Fun. Come for the conference, stay for the weekend. Audio recordings will be available. See the community committee bylaws for more information on these positions. Please consider sharing your experience, strength, and hope through Step Twelve service at the community level! A group's Seventh Tradition suggested percent contributions are in parantheses, after establishing "meeting expenses," and "prudent reserves."